Films dealing with the exuberance of youth are in vogue in recent years and their ‘bromance’ is loaded with many an enjoyable sequences. And, remember they are fond of limiting the friends to just 'three' in number and not more in all those famous films. 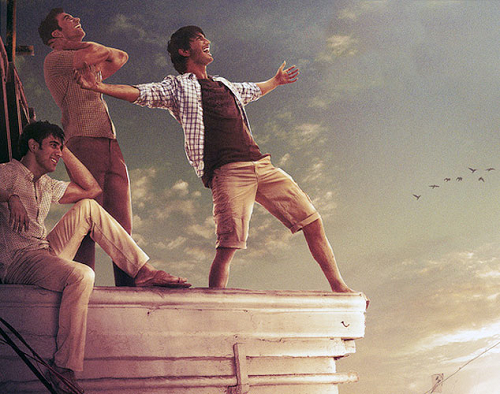 ‘Kai Po Che!’ has another credit of being based on new age writer Chetan Bhagat’s best seller ‘The 3 Mistakes of My Life’. This movie also has a clever screenplay written by four not three. Three youngsters of different characters are the protagonists; one a promising business man (Govind), another a slightly crafty practical man (Omi), the third irritatingly flamboyant and typically emotional (Ishaan). Well, these three with differing qualities are ‘good’ friends and willing to help each other. But, destiny plans their lives in a different way. The story keeping Gujarat as the place of action intentionally included two historic incidents, the earthquake and Godhra riots, as part of the narration which also create turns in their lives,. The story also dwells deep in the Indian’s craze and madness for cricket. So we have an unsuccessful cricket player who wants to create a star. Another one tries to cash on the cricket craze by opening a shop with cricket bats, balls and accessories. The third becomes a politician. The smart screenplay overshadows the many logical drawbacks. The movie’s strength is its youthful energy and freshness and the main players Rajkumar Yadav (Govind Patel), Sushant Singh Rajput (Ishaan Bhatt) and Amit Sadh (Omkar Shastri) performing their roles with absolute conviction. In fact, it is their presence and almost their youthful pranks and camaraderie alone make the film watchable notwithstanding the fact that there is no strong woman character in the story. The ambience is natural and the music is luckily unobtrusive. The photography is imaginative and simple. I had a doubt whether it will be appealing for a non cricket lover like me. But, I sat through the movie because of the three main young performers. Thank you Prof Shubha Tiwari for sharing and echoing my opinion! I also liked the movie. It's good that original movies are being made in India now; movies which are not undeclared remakes of some Hollywood stuff. This movie was very real, very true. One forgot in the middle that it was a movie. Typical Gujarati characteristics- the business knack, knotty girls, passion for cricket- made it look very real indeed.